Tutan's blog: What types of application can I test with Concordion? What types of application can I test with Concordion? Following on from my Agile Acceptance Testing presentation at the APN on Monday, there were some questions about what types of application you could test with Concordion. 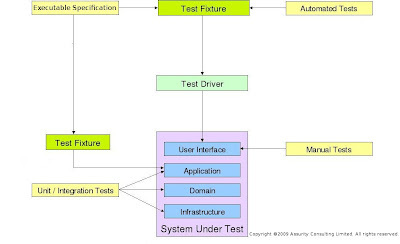 Concordion itself is a test framework which runs your executable specifications using test fixtures. The executable specifications are written in HTML and are independent of any programming language. The same executable specifications can be used with Concordion for Java, or Concordion.NET. (and a subset of the syntax can be used with the Ruby and Python ports of Concordion). There are 2 main ways in which Concordion is used. Either through the User Interface, or "under the covers" to the application or services layer. When testing "under the covers" of the application, the test fixture calls into the application code directly. In this case, the type of application is largely irrelevant. Additionally there are a lot of test extension libraries available, such as DbUnit and XmlUnit that can be called from your test fixture. Concordion is a great framework for running your executable specifications. When combined with the right driver you can test pretty much any type of application.